On 25th April 1871 a policeman discovered a young woman named Jane Maria Clousen on her hands and kness on Kidbrooke Lane in Eltham. She had been beaten by a hammer and died of her injuries five days later in Guy’s Hospital. She was only seventeen years of age. 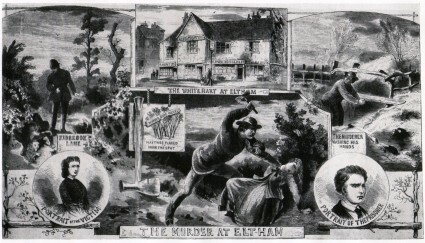 The murder of Jane Clousen (The Eltham Murder) remains unsolved and it has been claimed that Kidbrooke Lane is haunted by an apparition attributed to her and also ghostly screams. Jane Maria Clousen was born No 44 New King Street, Deptford, 27th April 1854. Her father was James Clousen and mother Jane Clousen. 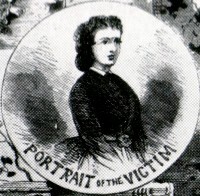 Janes older sister, Sarah, died of consumption in 1863 when Jane was nine years old. Her mother died four years later. A year after her mother’s death, aged fourteen, Jane entered service as a maid in the household of the proprietor of a Greenwich based printing company, Ebenezer Whitcher Pook and his wife Mary. Jane was described as being ‘rather a good-looking girl—not dirty, a very clean, respectable young woman, hard-working and industrious. Whilst working at in the Pook hosehold on London Street, Greenwich, it is said Jane had a relationship with Ebenezer’s son, Edmund Walter Pook (born Walworth 1851 – died 1820) who was three years older than her. On 13th April 1871 Jane was dismissed from service. The Pook’s claimed that her work was slovenly, her appearance unkempt and her attitude was lazy and unpleasant. However it was suggested that she was dismissed because of her relationship with Edmund and fear that he will end up marrying below his station. Jane moved to 12, Ashburnham Road, Greenwich. It was suggested by the Police that she continued to correspond with Edmund and met him secretley. After telling Edmund that she was pregnant he agreed to meet her in the Blackheath area and they would run away together. There was however no evidence spporting claims that Jane and Edmund ever wrote to each other or that they met after her dismissal. In fact during the testimony of Inspector John Mulvany of Scotland Yard they recounted an interview with Pook where he denied seeing her after her dismissal. Denied writing to her and described her as a ‘dirty young woman’. Jane was indeed pregnant and had been for about 2 months. However, the baby was dead and already decomposing. It was considered that the baby had been dead about two weeks, which would put its death at about the time she was dismissed from the Pook household. A stain was found on the right wristband of the shirt Edmund Pook wore on the evening of the murder and he had a scratch on his left arm. He told the police he had seen Jane that evening in the company of another man, and remembered telling his brother when he got in, who confirmed the statement. Edmund Pook was arrested and tried for the murder of Jane Maria Clousen. The police at the time considered the evidence pointed toward Pook being responsible. 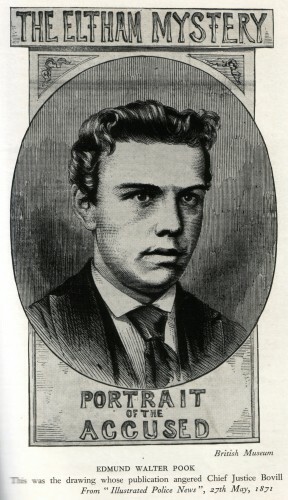 Pook was found guilty in the Coroners Court (where he was represented by Henry Pook – no relation) and the case then went to The Old Bailey on 10th July 1871 where the trial received vast media coverage and Pook was found innocent and acquitted as there was a lack of credible evidence. Some however saw the trial as a farce and thought he had escaped justice through his family’s connections. Pook even had to take out a civil case against slander which he won when a pamphlet saying he murdered Jane was printed and distributed. However, such was the media storm and public outrage surrounding the case, Edmund and his family fled London.Jane Maria Clousen was buried at the Brockley and Ladywell Cemetery and was carried there on a horse drawn carriage with female pall bearers dressed as maids. It is worth noting that a labourer named Michael Carroll some time later confessed to the murder whilst he was in Australia. The Sydney Police offered to detain him but Scotland Yard Authorities did not consider this man to be Clousen's murderer. Ghost? Is there evidence of the ghost? I am not sure and have not read any actual witness accounts. It could just be nothing more than the typical ghost story we often find attached to old famous murders. My thanks to Ian at mysteriousbritian.com for allowing me to post this story. I just wanted to say Thank you for this story. Edmund or Walter as he was known in the family was the son of my Great grand uncle.